Sustainable economic development is a process of investment, value creation, and reinvestment to expand the economic engine. Those economic engines that are able to provide a consistent and solid return on investment are able to draw in new resources and investments that keep the circle of influence growing. The system becomes a perpetual changing machine that develops new innovations and efficiencies that translate into market impact. To formalize this concept let us consider an example of an investor that contributes $100 into a business venture in hopes of earning higher revenue than what their local bank can offer. The success of a higher return on investment is based within the ability to raise the value of that money through new products and services that are sold on the international market for a profit. The ability to raise value is based in labor skill, the cost of obtaining resources, the technology available to increase the productive aspects of the system, and the legal infrastructure that allows such activities to occur. Assuming that the inputs allow for value creation, it is up to the decision makers to put these elements together in an innovative way that develops something of higher value. Therefore, management abilities cannot be ignored in this process. The eventual return on sales will be used to pay labor, investors, and other expenses. Money that is not used by labor for maintenance or to repay back the initial investment is the profit that turns into labor and investor saving rates (ROI). As this money will continue to lose value sitting in a bank account due to such problems as inflation it is reinvested back into the system. Part of the tax revenue, like reinvestment, is used to improve upon the hub’s infrastructure (virtual or physical) to create a more efficient value generation system. 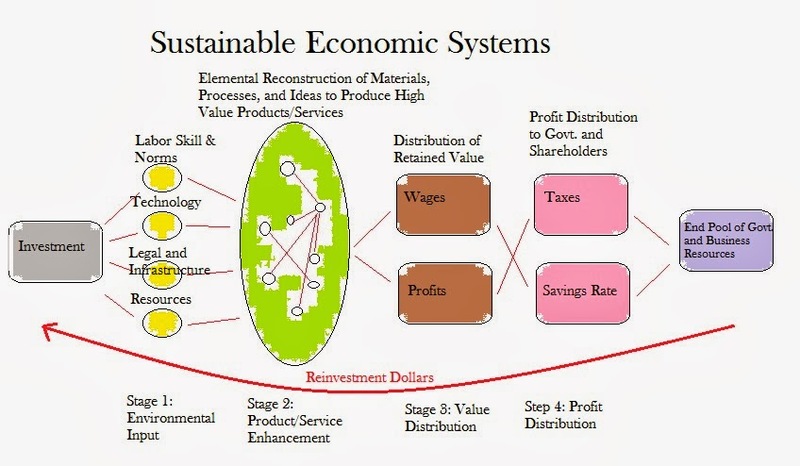 Sustainable systems create perpetual value through investment and return of value on that investment. Growing systems can draw in new investments from outside sources that seek to also earn a higher return rate. These investors may contribute money, build businesses within the economic hub, or supply cheaper resources to that hub. It is possible to see the economic hub as a value creation assembly line that seeks to draw in cheaper and better quality resources.